This entry was posted on Wednesday, February 29th, 2012 at 12:58 pm	and is filed under 3D ENGINES, TECHNOLOGY. You can follow any responses to this entry through the RSS 2.0 feed. Both comments and pings are currently closed. I am really curious on this part “WWW classes. Note that you can write your own ActionScript that uses Adobe networking APIs.” does that me it’s possible to write as3 classes? 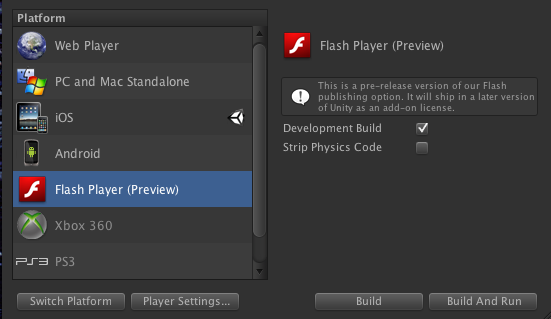 I checked and Unity does generate a bunch of as3 classes… Would you by chance have any insight on this? Here’s a link to the .swc that Ralph Hauwert made at Unity: http://forum.unity3d.com/threads/116650-UnityShared.swc-Communicating-between-Unity-Flash-Content-and-AS3 It shows how to setup a communication link.